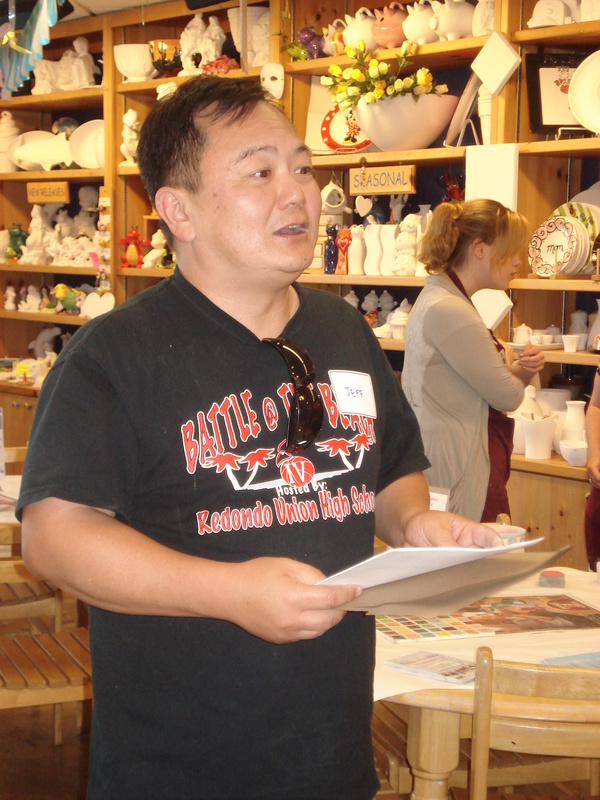 Community Events | JACL PSW in Blogland! Local Fundraising – A great way to bring out people to local events! A group of amateur artists gathered in Torrance on a beautiful spring day. We were there to paint! Eri, Nancy, and Stephanie – our very talented PSW Staff – have been thinking of creative ways to bring out our chapter members, community friends and program partners – but also raise money for our excellent youth programs. 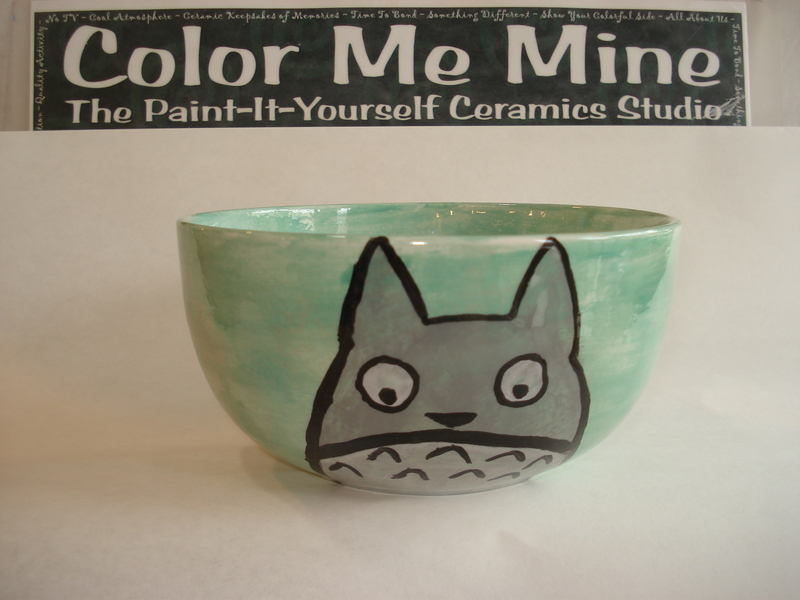 This fun afternoon at Color Me Mine was a break from our traditional program/fundraiser. I must say – we had some real talent! I had the opportunity to sit with Jeff Murakami and family as they created one-of-a-kind art pieces. Throughout the course of the event, I learned that we had many first-time painters in our group. Like me, they had never done anything like this before. But we also had several seasoned painters as well. This is such a fun family activity. In the middle of the painting, we got a very nice update on some of the Youth Programs that are going on in the district. Lawrence Lan talked about Collegiate Asian Pacific Internship. The proceds from this event helped to fund this year’s program. Jeff Murakami spoke about Camp Musubi that happens right in the South Bay. Another event that has a South Bay connection is Katarou Histories. Due to the popularity of that program, we are offering sessions at the Gardena JCI this year. Jeff Murakami speaks about Camp Musubi summer camp! After we painted, we ate on the patio just outside the studio. It was a great way to end the very successful fundraising event. This was a very simple event to coordinate. And, it can be taken to nearly any chapter in our district! If you have an interest to gather some families to paint, have a nice afternoon, and raise funds for the PSW Youth Programs – just let the PSW Staff know. We need to continue to find creative ways to engage our families in JACL. Having direct feedback at these types of events helps us to further tailor our Youth Programs to fit the needs of our membership. And, the fundraising dollars we earn directly helps our on-going programs. I woke up at 5AM this past Saturday to get ready for the long drive to Manzanar, the incarceration camp that held thousands of Japanese Americans from the Los Angeles area. When I first learned about the Japanese American camps, I was a junior in high-school, and I recall seeing this photo of children behind the barbed wires. In the background were the Sierra Nevada Mountains. Since then, I’ve learned so much more about the history and heard personal stories of Manzanar. I’ve probably seen a few dozen photos of the camp and always noted the beautiful mountain range that sat at the backdrop of this prison camp. Therefore, it didn’t surprise me that I knew exactly when we were near Manzanar because I recognized these mountains from miles away. 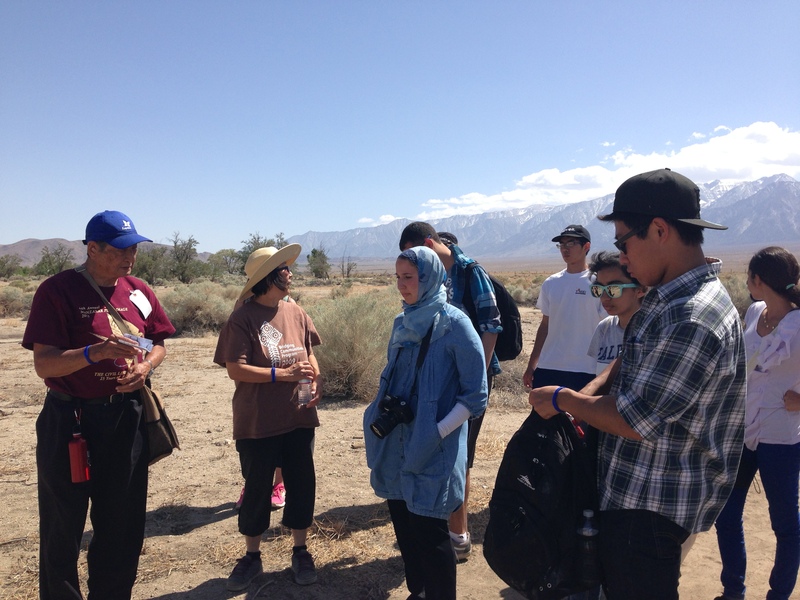 Wilbur Sato, a former incarceree, gave us a tour of what was left of Manzanar. He showed us a site where a garden used to grow and where a small pond used to be. A garden! In the middle of the desert! To me, this was the sign of resilience of the Japanese Americans. To thrive and the make the best of what is given. The Japanese mentality of shikataganai turning into the will power to survive, ganbarou. Although it was not easy driving almost 8 hours round-trip to be a part of this pilgrimage, I do not regret the experience. Many things can be learned through textbooks and oral-histories but physically being at a site where history occurred is an emotional experience that can only be understood by being there. I truly hope that the Bridging Communities participants gained something valuable from this mini road trip. I sure did. Last month I was asked by a former CSUN student who was asking on behalf of a California State University at Northridge (CSUN) faculty member, if the San Fernando Valley had a Japanese American history tour. It was an interesting thought and I answered, No. I had met this student while working on a research grant with the CSUN Asian American Studies, the San Fernando Valley Japanese American Community Center and the San Fernando Valley Japanese American Citizens League. Try going to the library or public records. You will find little or no records that the Japanese lived the San Fernando valley. It was through the oral histories collected and the research that were we able to discover that there were 132 Japanese American produce and flower farmers. Since they couldn’t own the land (Alien Land Law), they had to lease it, thus no records. After WWII broke out, the Japanese and Japanese American families were removed from their homes. It was decades later, 3 decades for my family before they would talk about the removal, the relocations camps and the assembly centers. It took 60 years before the 20 oral history interviewees agreed to talk and record their personal stories about life before, during and after camps. With the discovery of the detention station internees are coming forward. This detention station is part of our forgotten, lost history. This detention station and the stories that go with it are an integral part of U.S. history from 70 years ago. Let’s remember to not lose or forget the Japanese American part of U.S. history. On Thursday, April 18th in Room 1010 of the Los Angeles City Hall the Cultural Heritage Commission met to vote on the Historic-Cultural Monument Application of the Tuna Canyon Detention Stations site. More than a dozen community members came out to speak in support of designating the site as a Historical Cultural site. JACL Pacific Southwest District Governor, Ken Inouye, PSW District board member, Kanji Sahara and San Fernando Valley JACL board member and SFV Japanese American Community Center President, Nancy Oda. Ken Bernstein, AICP, Principal City Planner Office of Historic Resources summarized the Los Angeles Department City Planning Recommendation Report stating “That the Cultural Heritage Commission not declare the property a Historic-Cultural Monument”. 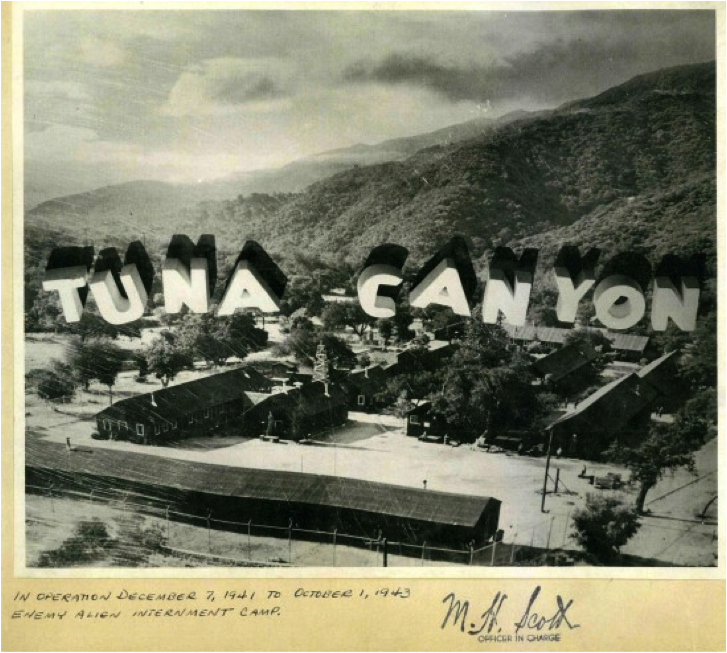 The Cultural Historical Commission voted to support the City Planning Report not to support designating the Tuna Canyon Detention Station as a Cultural Historic Monument. The Cultural Historical Commission will now take their recommendation to the City Council for their vote. The application for designation will require 10 votes to pass. What’s our next step if council votes against the Cultural Historic designation? -Working with Councilman Alarcon in finding ways to create an educational and appropriate display of the detention station. The Cultural Historic Commission has required him to meet with the property owners. -Check on other Historic Cultural designations on a State or Federal level. JACL Pacific Southwest District and the San Fernando Valley Community Center will continue the efforts to save Tuna Canyon Detentions Station history. For more information about the Tuna Canyon Detention Station, please view the following websites and documentation. What Does Historic-Cultural Monument Status Mean? I’m happy to announce that we are relaunching our blog along with the rest of our social media platforms! We’ve already created our new JACL PSW facebook page and you may have noticed that we started tweeting again! Please check out those pages and like/follow us to keep up with all our latest news. There will be a new blog every Monday written by Regional Director, PSW Staff and PSW members to keep you updated on all the things that have been going on in our wonderful district. 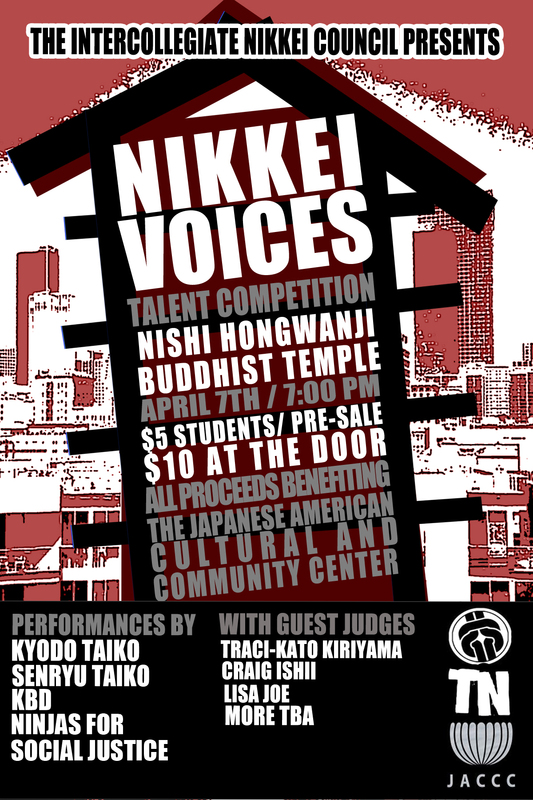 To kick things off a little bit, I’ll be reflecting about an incredible event that I went to last night called Nikkei Voices. This was organized by the Intercollegiate Nikkei Council, with all the proceeds going toward the JACCC. Scott Shima, one of the key organizers of this event, invited me to speak on behalf of the JACL during the event. You can see my picture here. It’s kind of hard to see, but I promise that’s me! It was incredible to see how many students came out to support their peers and the cause on a Sunday evening from all over Southern California. All the performers were very talented with acts ranging from comedy to dance to vocal performances! For me being new to the community, it was a great opportunity to introduce myself to these students, but I was also so excited to see the INC come together for a community cause. To me, this is what working for the community is all about. Coming together when someone is in need, helping them out, and doing it in a fun way! These college students were inspiring for me, and I look forward to seeing what else the INC has in store! Please look out for our future blogs!